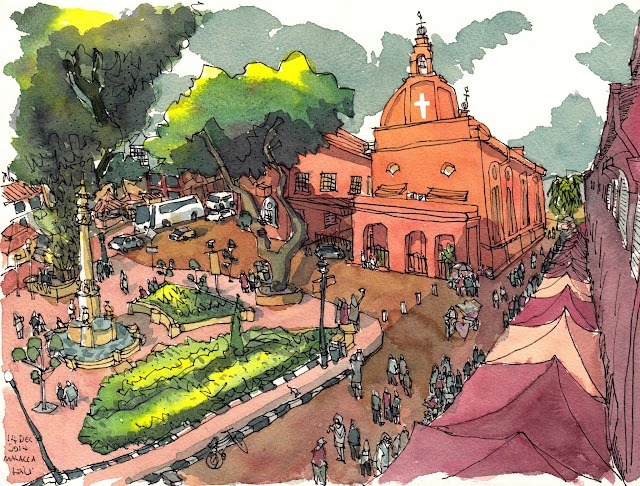 I had a short trip to Malacca a few days ago and here are some sketches. This was drawn in the morning around 730am before the tourists arrive. Right at the back is the Christ Church that was built in 1753. It's a black and white sketch so you can't see that the buildings are actually red. I told myself I had to go back again to sketch again and add in the colours. So this is the sketch I drew the next day in the late afternoon, just as the building on the right was casting shadow on the church. It was a crowded and busy Sunday. The white cross was actually added in Photoshop. I had forgotten all about the cross and painted the whole building red and only realised it back at home after scanning. Here's the video of my sketch trip with several friends.